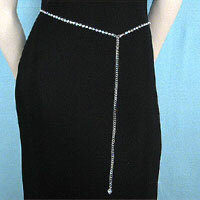 Narrow one-line crystal rhinestone belt. 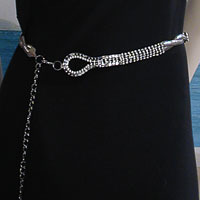 This belt has 28 inches or rhinestones followed by a chain which is used to fasten the belt with a lobster claw fastner. The end of the belt is topped off with one larger rhinestone. Color: silver. Hue: silver. color code: #C8C8C8. 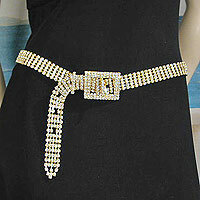 Measurements: waist 28-41", width 1/8", length 42"
Three-line crystal rhinestone belt. Solid crystal rhinestone belt with a rhinestone buckle. The belt fits a variety of sizes. Measurements: waist 30-35", width 3/8", length 40"
Medium width crystal rhinestone belt fashioned with 5 rows of clear crystal rhinestones. 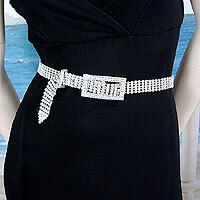 Measurements: waist up", width 5/8", length 38"
Five line crystal rhinestone belt with rectangular buckle. This is a medium large belt with a rhinestone buckle. It fits a variety of sizes. Measurements: waist 29-34", width 3/4", length 37"
Wide crystal rhinestone belt fashioned in an openwork X and oval design. The solid rhinestone buckle has pav? stones surrounding large crystals in a 4 stone line. Measurements: waist 10-41", width 15/16", length 42½"
Six line crystal rhinestone belt with six point flower buckle. May be fasened at any point on the length of the belt. Measurements: waist 1-40", width 1", length 42"
Five line crystal rhinestone and mesh belt. It fastens on a loop faux buckle with an adjustable chain. Color: pewter. Hue: pewter. color code: #BABCC2. Measurements: waist 27½-41", width 5/8--1-3/8", length 42"